Sigh. Picked this hitchhiker up while rounding the corner from Overland onto Venice Boulevard, where it ran itself through the tube within. I gamely attempted to patch the entrance and exit wounds, but it was getting dark and cold and so I finally replaced it with my last new one and got myself over to Orange 20 bikes in the Bike DistrictSquareZoneCenter where I purchased a new supply of innertubes and a new pair of tires, too as these ones were showing their age and how. Oh well. Such is life on a bike. 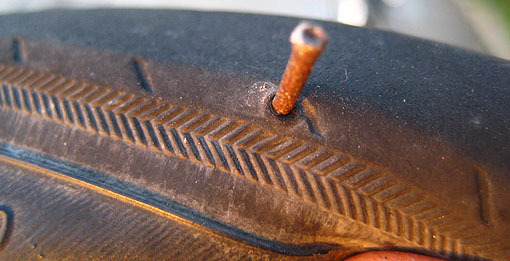 At some point or another if you ride as much as I do, through everyone’s treads a nail must impale. This entry was posted on Monday, April 14th, 2008 at 8:45 pm and is filed under biking. You can follow any responses to this entry through the RSS 2.0 feed. Both comments and pings are currently closed.